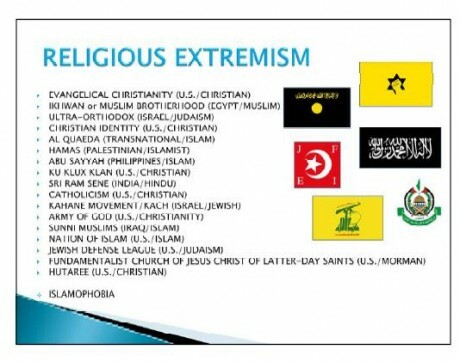 A U.S. Army Reserve equal opportunity training presentation entitled “Extremism and Extremist Organizations” actually included “Evangelical Christianity” as an example of “Religious Extremism” in a list that also included al-Qaeda, Hamas and the Ku Klux Klan. You can find a copy of the entire presentation right here. Is this how evangelical Christians will be treated in the future? Will evangelical Christians be treated like members of the Ku Klux Klan or like members of al-Qaeda? Extremism is a complex phenomenon; it is defined as beliefs, attitudes, feelings, actions, or strategies of a character far removed from the “ordinary.” Because “ordinary” is subjective, no religious group would label itself extreme or its doctrine “extremism.” However, religious extremism is not limited to any single religion, ethnic group, or region of the world; every religion has some followers that believe that their beliefs, customs and traditions are the only “right way” and that all others are practicing their faith the “wrong way,” seeing and believing that their faith/religion superior to all others. Well, that is exactly what evangelical Christians believe. They believe that the death of Jesus Christ on the cross is the only payment for sin and thus the only way to be reconciled to God. Unfortunately, this belief is now enough to be labeled as a “religious extremist”. And sadly this is far from an isolated incident. Since Barack Obama was first elected, Christians have been demonized in government report after government report. In a previous article entitled “Patriots And Christians Have Been Repeatedly Labeled As Potential Terrorists Since Obama Became President” I detailed many of these instances. . . . .